When I was a young teen in the 80’s I remember watching the news and learning about apartheid in South Africa. I remember learning about a powerful man who had been jailed simply for believing in equality and freedom/ all watching the evening news and seeing protests at Yale against apartheid. My young naïve mind just couldn’t comprehend this great injustice. I went to work making homemade t-shirts in my bedroom with black and red marker that read “Free-South Africa”, “Abolish Apartheid” and ” Free Mandela”. I told anyone at school who would listen about what was going on in South Africa and told them that we must do something. Unlike today if you thought about anything other than your Guess Jeans and your Benneton shirts in middle school in the 80’s you were a big freak. Years later during the college interview process (to a school I did not get into) I was asked the question who is your hero? I replied Nelson Mandela—a man of conviction and honor and could only aspire to have half the strength and conviction as he but his determination and belief in equality were a source of inspiration. The image of a finally free Mandela brought a big smile to my face as I hoped that this icon of peace and freedom would transform a broken country and continue to bring hope to the world. Fast forward to my third year in college—I enrolled in Semester at Sea, a study abroad program on board a traveling ship which takes students around the world. To me this was to be the trip of a life time, ports of call included Venezuela, India, Kenya, China, Brazil, and Cape Town South Africa. 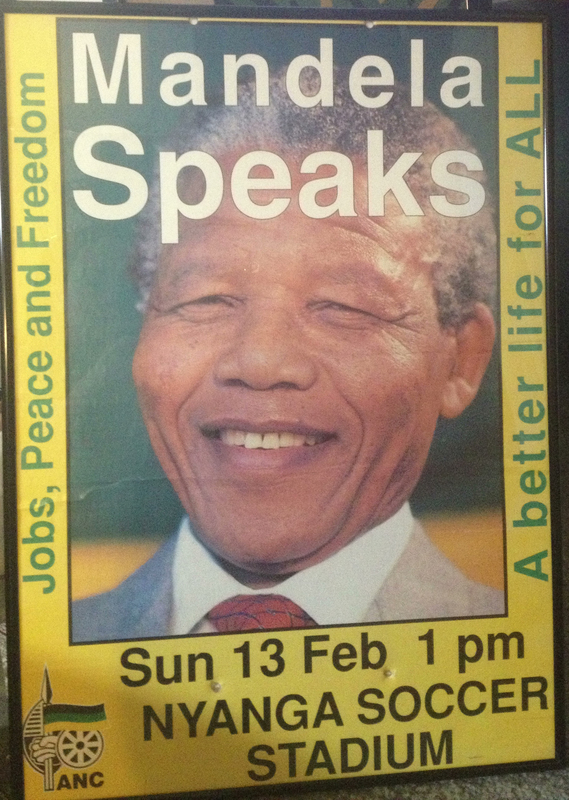 We were to be in Cape Town in mid- February 1994 just a few months before the first fully free elections were to be held in South Africa. We docked in Cape Town for several days – tensions were high—a few months earlier a young California student had been stoned to death just before she was to return home and a common phrase being used was “one white one bullet” a phrase our taxi drivers repeated often during our brief stay in Cape Town—they were trying to warn the young Americans to be careful and to stay safe. I signed up through the program for a township visit that was described as a visit to a township to gain a greater understanding of life for black South Africans and a visit to ANC headquarters in the township to discuss the upcoming elections. I was one of many who boarded a bus for the ride to the township. As you would expect the conditions were startling to an American who had grown up in CT. There was some amount of culture shock. We made our way to the ANC office and things were buzzing, Mandela was to be giving a campaign speech at a nearby soccer stadium the next day and the campaign workers were busy trying to mobilize a crowd. They were very interested in speaking to students and telling us how critical and important this election was, they had fought hard to get here and this was their chance at a free, open, and democratic society. The opportunity to vote and to have their voice heard was nothing they would ever take for granted. 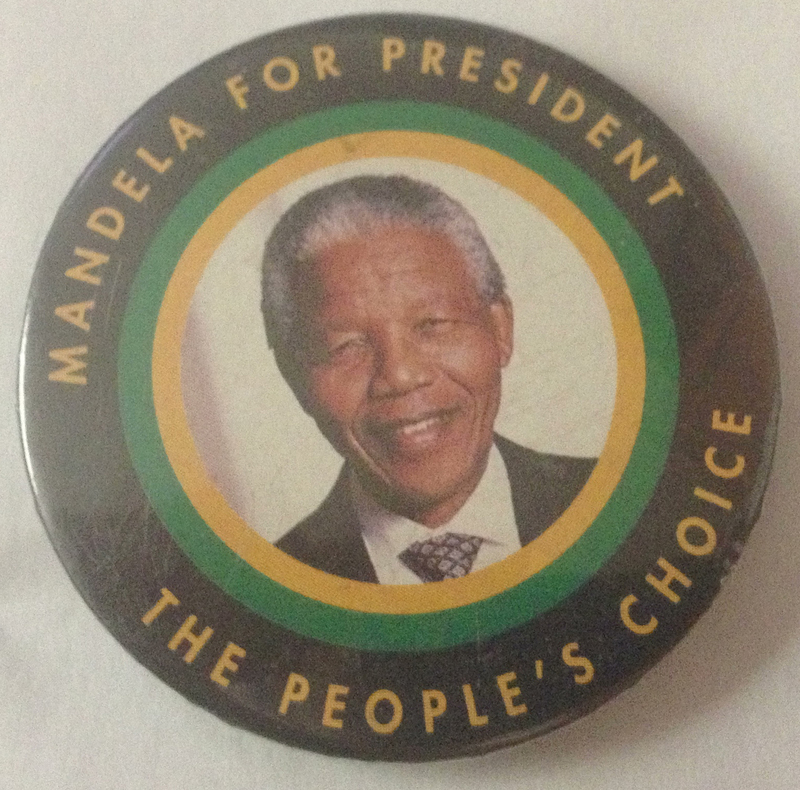 They gave us campaign posters and pins and calendars, all things which I treasure to this day. They told us we should go to the speech- that we should go hear him at his campaign rally. The shipboard administration was then able to arrange this. I was excited beyond belief. 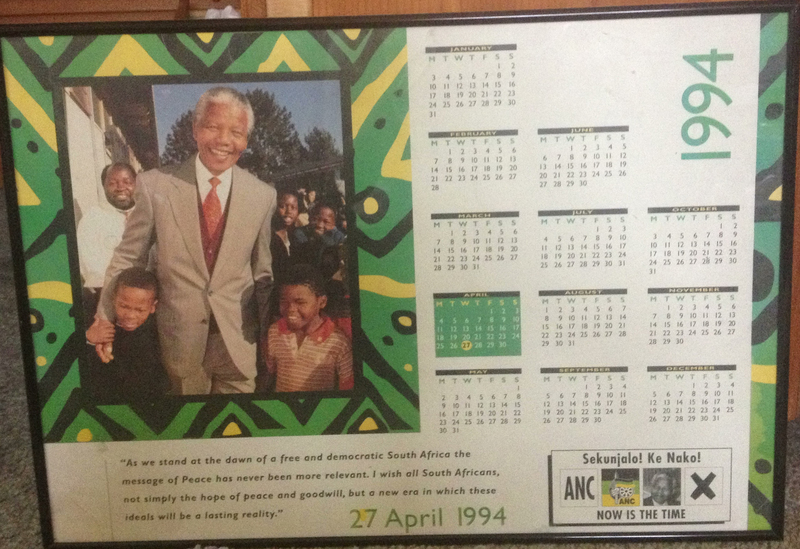 I was really going to see the future President of a free South Africa the next day. I could not sleep that night I was full of anticipation and worry. The words of the taxi drivers telling us it was not safe and the young woman had been killed by a mob of South Africans. Would it be safe for me? I had always been afraid of crowds. I wasn’t going to let my petty worry stop me – I was going no matter what. I woke up eager to go. We arrived at Nyanga Soccer Stadium on Sunday, Feburay 13, 1994. It was a big open field with a stage setup. There were thousands of people, all black South Africans able to vote for the first time. They were electrified. It was like nothing I had ever seen before. There was a group of maybe 75-100 of us mostly white American College students. I was expecting to be put way in the back but the security guards and police after some discussion decided that the safest place to put us was just in front of the stage. If you can picture it, thousands of people, a few dozen guards making a human chain, and then us and some others. The crowd was huge and excited. I don’t know if I can ever accurately express the feeling of hope and opportunity dawning. They were trying to get closer and closer and the guards were pushing them back, I began to feel badly that I was in front I should be in back they want to be close and they should be. I was a little afraid of the crowd, not because they were violent but because it was so big but just then, he emerged not more than 50 feet from me. 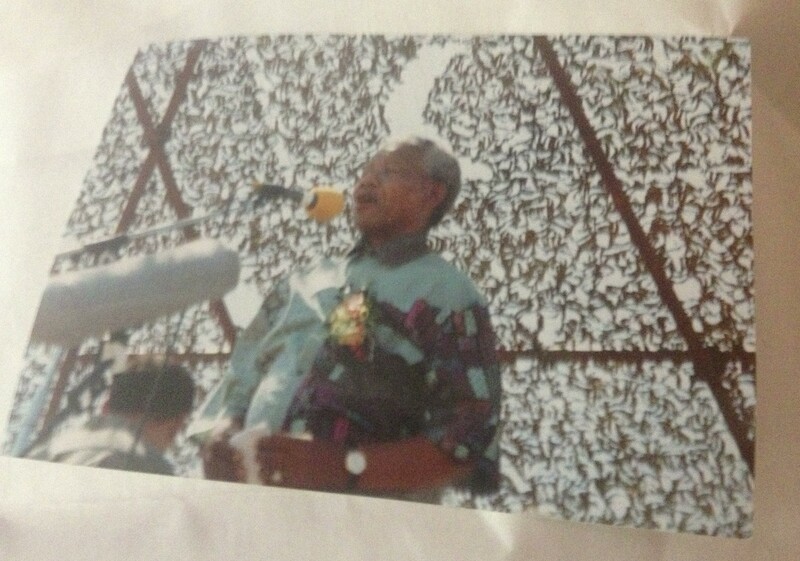 Nelson Mandela was standing next to me and the crowd erupted. I can still here the cheers. He spoke as eloquently as you can imagine about, peace, freedom, economic opportunity, the emergence of a new era, a new country. The crowd behind me had suffered under great injustice for a long time –they were facing a bright and hopeful future in part because of the man standing in front me. I was frozen. I could not even comprehend that here I was standing in a soccer stadium in South Africa and in front of me was the soon to be President of a free South Africa, a man I had admired for many years. Towards the end of his speech he briefly addressed us – I remember he stated that U.S. college students had always stood with South Africa and that the world is watching and the world is with us – my mind went back to when I was a geeky teenager and wearing a hand drawn t-shirt to middle school, tears began to roll down my face, I was overwhelmed. It was just then as he was closing that I saw the crowd rushing the stage and the guards no longer able to contain them. I was afraid I would be trampled. I panicked, I saw one other person crawl under the stage I followed as quickly as I could not clearly know where I was crawling. I emerged on the other side of the stage, I was pushed in front of a silver sedan and just as I stood up, there he was stepping off the stage right in front of me. I looked right at him and then he shook my hand and said to me thank you for coming thank you for your support. I don’t remember what I said to him. I think it might have been thank you and good luck. I was then pushed out of the way and into the crowd. It was all a blur from there. I HAD JUST SHOOK NELSON MANDELA’s HAND. I was shaking with disbelief. I got back on the bus and called my parents form a pay phone later that night (before cell phones and internet). I was in tears- I didn’t think they would believe me or anyone would believe me. I reflect on that moment and still think it was all a dream. It is a memory I cherish. I have thought about that time over the years, particularly around election time. What people have gone through to have their voice heard, to have the chance to vote, to have the ability to participate in an open and free society is a true source of motivation for me. I never take my right to vote for granted and it one of the reasons why I work in a field that promotes global understanding. It is again with tears in my eyes today that I wrote this at hearing of the passing of a great man. A man that touched my life (and my hand) a man I remember as a great inspiration to the world. I know his spirit and legacy will live on. It will live on with the legacy of truth and reconciliation he leaves to South Africa, the ultimate freedom from oppression, and it lives on in the spirit of all the young people around the world that fight every day for social justice and equality. Very touching story Megan, thanks for sharing such a memorable story about a man the world so loved!